U.S. travelers to many European cities often note the very large number of bicyclists of all ages and abilities. Indeed, bicycles are used for nearly half of urban trips in cities like Amsterdam and Copenhagen. Another notable feature of these cities is their extensive network of infrastructure dedicated to bicycling. Their bikeways allow cyclists to travel largely separated from motor-vehicle and pedestrian traffic, mixing it up with cars mainly at intersections. U.S. cities looking to expand their mobility options have started to emulate these European bikeway systems. These efforts have shown promise to increase bicycle commuting and utility usage, especially when establishing or completing a network of high-quality bikeways that allows trips of up to 5 miles to be made easily by bicycle. Bikeways that are generally separated from motor-vehicle traffic can alleviate potential bicyclists fears of traffic dangers. These facilities go by several names including protected bikeways, separated bikeways or cycle tracks. The Federal Highway Administration (FHWA) has endorsed the term "separated bikeways," and has developed guidance documents for their implementation in the U.S. The official definition generally requires the bikeway to be physically separated from traffic by a raised divider, a different elevation, parked vehicles or raised devices located within a buffer area. Also, the facility should generally be available only for use by cyclists, requiring a sidewalk or separate facility for pedestrians. While Denmark and the Netherlands get most of the headlines, Budapest and others are in on the action. Separated bikeways started to become widespread in Europe in the 1970s, where they are generally known as cycle tracks. There were also a few trial installations in the U.S. at about the same time, but U.S. agencies were also beginning to install bicycle lanes separated from traffic lanes only by painted stripes. Early experience from Europe determined that separated bikeways appeared to be more prone to collisions between automobiles and cyclists, especially where the bikeways crossed intersections, exposing cyclists to turning or cross traffic. The promise of early striped bicycle lanes on the roadway appeared to result in less safety concerns. In addition, bicycle lanes were generally less costly to install on existing streets, and they posed less problems for street cleaning and snow removal. 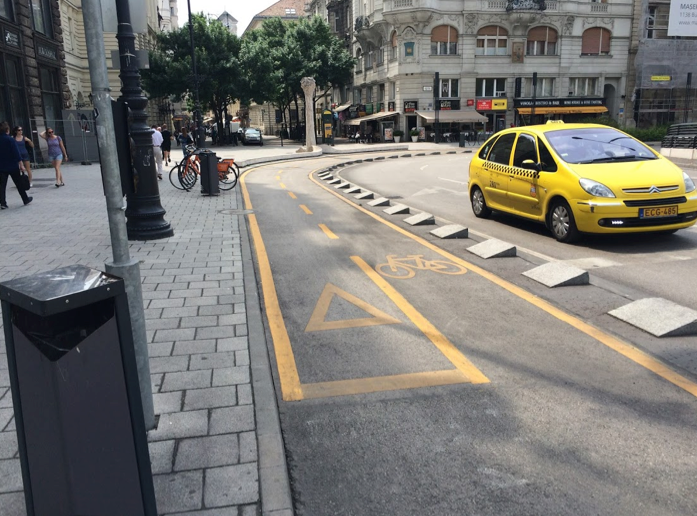 As a result, the U.S. moved to a system built around bicycle lanes, while Europe continued to develop and refine their design practices to provide cycle tracks. After 40 years of experience in bicycle facilities, U.S. bicycle usage has generally remained at or below 1% of all trips, while European experience ranges from 10% to nearly 50%. There are many reasons to explain the differential, but many people believe that the low-stress bicycling environment may be necessary to see significant bicycle usage. This often appears to require separated bikeways and other facilities that provide a high sense of safety while leading to many possible destinations. There is increasing evidence that U.S. cities providing separated bikeways and other low-stress designs have started to see significant increases in cycling, large enough to begin to see changes in overall traffic behavior, especially at or near the city center. Separated bikeway implementation in the U.S. is being closely watched to determine whether bicycle- and traffic-safety issues will become a significant problem. U.S. bicycle fatalities have been rising faster than other traffic fatality types in the past few years. Separated bikeways can result in car/bike interactions that appear to be similar to interactions on other road facilities that may result in crashes. These include “right hooks” where cars turn right cutting across the path of bicyclists to their right, and wrong-way cycling when a motorist waiting to enter the roadway looks to their left and moves forward into the path of a bicyclist approaching from the right, on the “wrong” side of the roadway. In contrast, separated bikeways greatly reduce the potential for crashes when a motorist overtakes a cyclist in their travel lane or when a motorist drifts to the right and sideswipes a bicyclist. 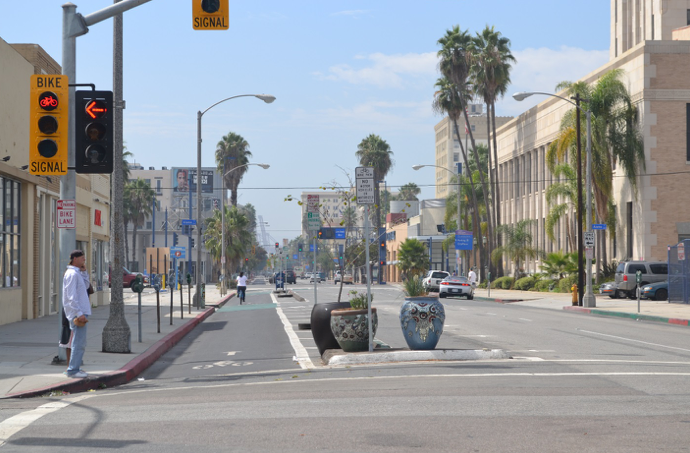 This bikeway in Long Beach, Calif., shows how to separate left-turn cars from through bicyclists. Separated bikeways normally employ design features that are intended to regulate or reduce the incidents of traffic movements that account for crashes. These include more traffic signs and markings that more clearly warn motorists of expected bicycle movements, including the use of green-colored pavement across intersections and driveways. There is not enough information yet known about the effectiveness of standard and experimental treatments, but recent academic research studies in the U.S. and Canada have shown substantial improvements in safety for travel within the separated bikeway compared to other treatments, especially away from intersections or driveways. Research studies are promising for bicycle travel across intersections and driveways, but there are many varied treatments in use, and there is no widely known guidance on which treatments work best at specific sites. The potential for crashes appears to be acceptable where separated bikeways cross driveways and roadways with relatively low traffic volumes and where there is infrequent motor-vehicle travel across the bikeway. This is especially true when the crossings are appropriately signed and marked to indicate that motorists should expect and watch for bicycles. Higher turning and crossing volumes are more likely to occur at signalized intersections and in commercial areas, especially when motorists can turn left or right into or across the bikeway at the same time as bicyclists can travel straight through. Europeans have had over 40 years of experience in experimenting with bikeway designs to address these problems. A key feature at signalized intersections in Europe is the provision of traffic signal faces and indications that apply only to bicyclists. At the busiest intersections, the traffic signals are designed to provide a separate interval for bicycle traffic or provide for bicycles to start moving while cars are still stopped. They also often use right-turn signals to stop cars while bicycles can proceed through across the right-turn path. Designs also have been perfected that provide separate facilities for bicycles to circulate around the outside of the traditional intersection area. 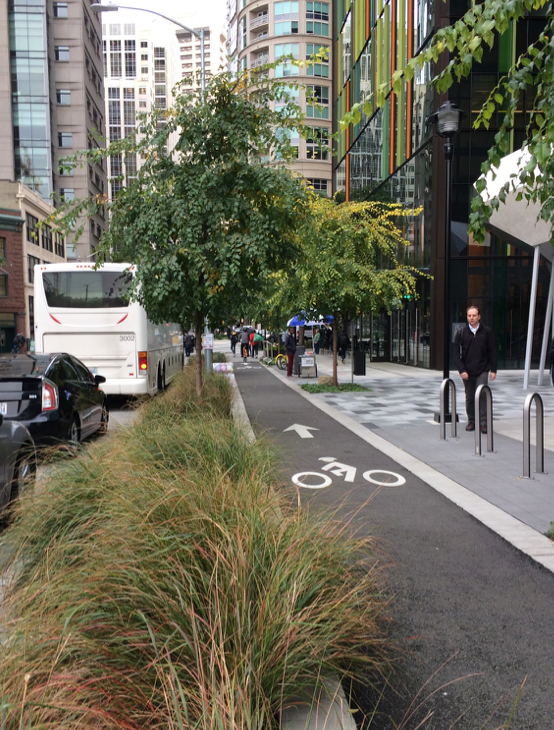 This new bikeway was constructed in front of Amazon’s headquarters in Seattle and paid for by Amazon. Communities vying to become their second headquarters were asked about commitment to bicycle infrastructure. Many of the new U.S. separated bikeways do not provide special traffic-signal operation at signalized intersections. Our experience suggests that these precautions may not always be necessary, but excessive traffic conflicts or bicycle-involved crashes can cause the need to reexamine our earliest designs. Communities that are considering designs to provide for separated bikeways may benefit from researching and copying designs that address similar circumstances with promising results. European designers generally have not been satisfied with layouts that provide for two-way bicycle travel on one side of a two-way street, especially in busy areas where traffic often turns across the bikeway. They generally prefer twin one-way facilities located on each side of the street. Two-way facilities are more favorable in lower-density residential areas, semi-rural areas and along one-way streets that serve two-way bicycle travel. These experiences tend to hold up for U.S. examples. Two-way bicycle facilities can be provided successfully alongside two-way roadways. But often they need extensive changes in traffic control, such as modernization of signal systems so that motorists are not permitted to turn across the bikeway, except when regulated by traffic-signal operations. 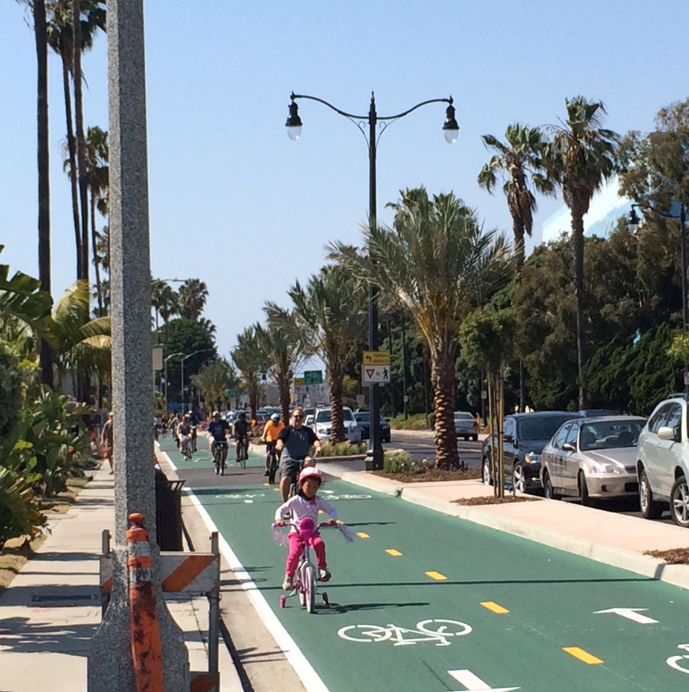 This two-way bikeway in Redondo Beach, Calif., features special signalization at major intersections. It serves over one million users per year of all ages and abilities. Maintenance is another factor that should be adequately planned for separated bikeways. They are normally narrower than motor-vehicle travel lanes, so street cleaning and snow-removal equipment may not fit within the bikeway area. Bicyclists will ask for assistance with snow removal, especially on important routes used by commuters. Without sweeping, broken glass, leaves and debris can quickly accumulate in the bikeway area, making it highly undesirable and discouraging its use. This problem can often be solved by providing the width needed for a two-way facility, but the concerns over crossing traffic will become greater. A careful plan will normally be required to guide a properly designed facility that meets user needs without difficult maintenance. Today, separated bikeways are often being designed using temporary features, such as traffic striping with plastic posts to separate bicycles from vehicles. These can be aesthetically pleasing and encourage use if done on fresh new pavement, but broken plastic posts and faded paint lines can age rapidly in an urban or weather-exposed environment. As communities become more confident in the permanent need for bicycle infrastructure, they will normally consider reconstruction to provide a median barrier, planter strips or a separate elevation for the bikeway. A complete network of separated bikeways serving a dense city center can often attract 10% or more commuter trips to the city center from nearby neighborhoods. And once cyclists find that they enjoy commuting by bicycle, they are not likely to give it up. Bicycling can also serve many non-commuting trips, such as shopping, entertainment or schools. This can make a tremendous difference in areas where parking is difficult or transit is crowded because travel times by bicycle are often faster within the city center than driving or transit. But potential new bicyclists generally must feel safe and comfortable riding in bikeways and must be able to reach their destinations with minimal travel away from bicycle facilities. 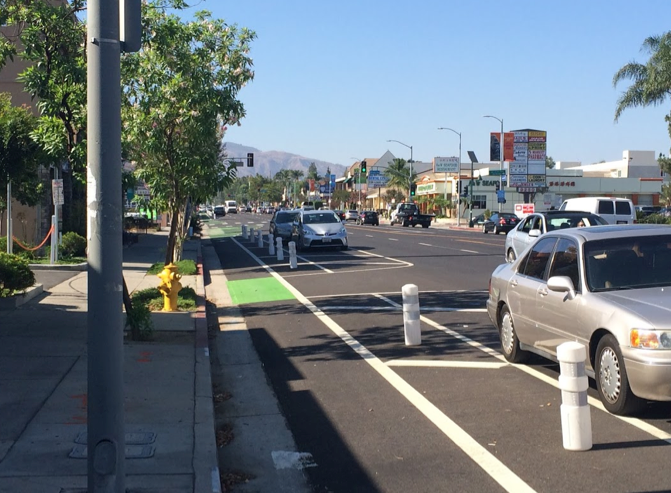 A new post-protected bikeway in Los Angeles, where parking is regulated to provide better sight distance. Bicycling can offer tremendous benefits for communities. These include reduction in traffic and parking, improved health and fitness, better attitudes, and more spending at local businesses. Also, often a strong majority of residents and voters will support the creation or improvement of a bicycle network, if it does not have a lot of negative attributes. The rate of bicycling in communities can almost always be increased through encouragement and infrastructure. When separated bikeways form an important component of the infrastructure, all that is left is the encouragement.